And I heard a loud voice from the throne saying, “Behold, the dwelling place of God is with man. He will dwell with them, and they will be his people, and God himself will be with them as their God” (Rev. 21:3). Who do you want to meet first in heaven? Jesus said to his disciples, “In my Father’s house are many rooms. If it were not so, would I have told you that I go to prepare a place for you? And if I go and prepare a place for you, I will come again and will take you to myself, that where I am you may be also” (John 14:2-3). The psalmists often wrote about their desire for God’s presence. “In your presence there is fullness of joy; at your right hand are pleasures forevermore” (Ps. 16:11). • “One thing have I asked of the LORD, that will I seek after: that I may dwell in the house of the LORD all the days of my life, to gaze upon the beauty of the LORD and to inquire in his temple” (Ps. 27:4). “As the deer pants for flowing streams, so pants my soul for you, O God. My soul thirsts for God, for the living God. When shall I come and appear before God?” (Ps. 42:1-2). “Whom have I in heaven but you? And there is nothing on earth that I desire besides you” (Ps. 73:23). Relationships are important in our earthly lives. Before God created Eve, he said, “It is not good that the man should be alone” (Gen. 2:18). In heaven, relationships will still be important. 1. In heaven, we will live with God. When John was given a vision of heaven, he “heard a loud voice from the throne saying, ‘Behold, the dwelling place of God is with man. He will dwell with them, and they will be his people, and God himself will be with them as their God’” (Rev. 21:3). John also writes that people in heaven will “see [God’s] face” (Rev. 22:4; cf. Ex. 33:17-23; Matt. 5:8). In the Garden of Eden, Adam and Eve walked and fellowshipped with God (Gen. 3:8). But after they sinned, they were banished from Eden (Gen. 3:24)—demonstrating man’s separation from God’s holy presence. The only way back into God’s presence is through Christ (John 14:6). God dwelling with his people in heaven is the consummation of God’s plan for humanity. God dwelled with his people in the tabernacle. “I will make my dwelling among you, and my soul shall not abhor you. And I will walk among you and will be your God, and you shall be my people” (Lev. 26:11-12). God dwelled with his people in the person of Christ. “And the Word became flesh and dwelt among us, and we have seen his glory, glory as of the only Son from the Father, full of grace and truth” (John 1:14). Today, God dwells with his people by the Holy Spirit. “Do you not know that your body is a temple of the Holy Spirit within you, whom you have from God?” (1 Cor. 6:19; cf. 2 Cor. 6:16). We don’t know what it will be like to see God’s face (“God is spirit,” John 4:24). But it’s easier for us to imagine what it will be like to see Jesus, who will forever remain God and man. “When [Christ] appears…we shall see him as he is” (1 John 3:2). Imagine the joy of seeing face to face the one who died for you! 2. In heaven, we will be reunited with Christian loved ones. When Christ returns, “we who are alive, who are left, will be caught up together with [the dead in Christ] in the clouds to meet the Lord in the air, and so we will always be with the Lord. Therefore encourage one another with these words” (1 Thess. 4:17-18). Will we remember one another in heaven? Yes. Paul’s words of comfort to the Thessalonians about their deceased loved ones lose their effect if we don’t remember one another in heaven. In heaven, are minds will be clearer, not foggier. Think of how your experience of heaven would be altered if your memory was erased. How can we enjoy heaven if we know that some of our loved ones are in hell? In heaven, we will have a better understanding of God’s justice. Still, we will not be pleased (as God is not pleased, cf. Ezek. 33:11) about the judgment of the unsaved. But we must remember that our God is the “God of all comfort” (2 Cor. 1:3). And we must rest in his promise that “He will wipe away every tear from [our] eyes” (Rev. 21:4). 3. In heaven, we will be one big happy family. Christians are “members of the household of God” (Eph. 2:19). In heaven, there will be no conflict, and we will be able to fully obey the command to love one another. Some married couples might be concerned about the lack of marriage relationships in heaven. Jesus said, “In the resurrection they neither marry nor are given in marriage” (Matt. 22:30). “This teaching might at first seem discouraging to married couples who are deeply in love with each other in this life, but surely people will know their loved ones in heaven, and the joy and love of close relationships in heaven will be more rather than less than it is here on earth” (ESV Study Bible, p. 1869). It’s painful to be alone. But, if you’re a Christian, you have God’s promise that in heaven you will never be lonely again. You will live with God forever. You will enjoy countless friendships with other followers of God. And you will be reunited with Christian loved ones—never to be separated again. Contrary to what some people say, the more heavenly-minded you are, the more earthly good you will be. The hope of heaven should help us value our present relationships. “As we have opportunity, let us do good to everyone, and especially to those who are of the household of faith” (Gal. 6:10). For to me to live is Christ, and to die is gain…. My desire is to depart and be with Christ, for that is far better (Phil. 1:21, 23). Randy Alcorn, in his book Heaven, writes, “I’ve collected more than 150 books on Heaven, many of them very old and out of print, and I’ve ready nearly all of them. One thing I’ve found is that books about Heaven are notorious for saying we can’t know what Heaven is like, but it will be more wonderful than we can imagine. However, the moment we say that we can’t imagine Heaven, we dump cold water on all that God has revealed to us about our eternal home. If we can’t envision it, we can’t look forward to it. If Heaven is unimaginable, why even try?” (p. 17). People often use 1 Corinthians 2:9 to claim that heaven is beyond our imagination: “Eye hath not seen, nor ear heard, neither have entered into the heart of man, the things which God hath prepared for them that love him” (KJV). But the next verse says, “But God hath revealed them unto us by his Spirit” (KJV). Also, these verses aren’t even talking about heaven! What about 2 Corinthians 12:2-4? In that passage Paul says that fourteen years earlier he was “caught up to the third heaven,” where he “heard things that cannot be told, which man may not utter.” In this case, God didn’t want Paul to reveal what he saw and heard in heaven. In contrast, God commanded John to write about his visit to heaven, which he did in the book of Revelation. So is heaven beyond our imagination? Yes and no. Heaven is beyond our imagination in the sense that heaven will be better than we can imagine right now. But it’s also true that, based on what God has revealed in the Bible about heaven, we can imagine what it will be like. There are many misconceptions about heaven. Jesus said that Satan is “the father of lies” (John 8:44). Satan wants people (both believers and unbelievers) to accept his lies about heaven. These lies include: (1) heaven isn't real; (2) heaven is boring; (3) heaven is the destination of most. Going to heaven is sort of like going to live in a country you’ve never visited before. If you were going to live in a foreign country for a year, how would you prepare? You would probably do some research on the country (search online, borrow a library book, etc.). As Christians, we should not neglect learning about heaven. Believers immediately go to heaven when they die. “We know that while we are at home in the body we are away from the Lord…. we would rather be away from the body and at home with the Lord” (2 Cor. 5:6-8). “For to me to live is Christ, and to die is gain…. My desire is to depart and be with Christ, for that is far better” (Phil. 1:21, 23). “And [Jesus] said to him, “Truly, I say to you, today you will be with me in Paradise” (Luke 23:43). In the Bible, there is a present heaven (the place where believers go when they die) and an eternal heaven (the place where believers will live forever after the final resurrection). Wayne Grudem writes, “…Christians often talk about living with God ‘in heaven’ forever. But in fact the biblical teaching is richer than that: it tells us that there will be new heavens and a new earth—an entirely renewed creation—and we will live with God there…. There will also be a new kind of unification of heaven and earth…. There will be a joining of heaven and earth in this new creation” (Systematic Theology, p. 1158). Based on Revelation 6:9-11, Randy Alcorn lists 21 observations about the present heaven. Here are a few of his observations. When these people died on earth, they relocated to heaven (v. 9). The martyrs are fully conscious, rational, and aware of each other, God, and the situation on earth. Those in heaven are free to ask God questions, which means they have an audience with God. It also means they need to learn. In heaven, people desire understanding and pursue it. The martyrs clearly remember their lives on earth (v. 10). They even remember that they were murdered. Those in heaven see God’s attributes (“Sovereign…holy and true,” v. 10) in a way that makes his judgment of sin more understandable. God promises to fulfill the martyr’s requests, but says they will have to “rest a little longer” (v. 11). Those in the present heaven live in anticipation of the future fulfillment of God’s promises. Unlike the eternal heaven—where there will be no more sin, curse, or suffering on the new earth (Rev. 21:4)—the present heaven coexists with and watches over an earth under sin, the curse, and suffering. 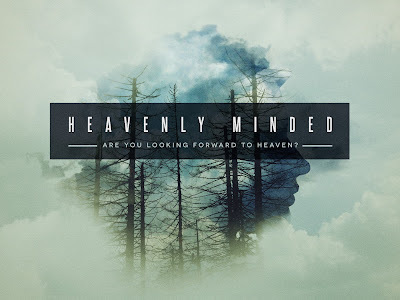 There’s an old expression that says, “Don’t be so heavenly-minded that you are of no earthly good.” Actually, the Bible says the opposite: the more heavenly-minded you are, the more earthly good you will be. For example, Paul was a heavenly-minded man, but he did lots of earthly good. “Seek the things that are above, where Christ is, seated at the right hand of God” (Col. 3:1). “Their end is destruction, their god is their belly, and they glory in their shame, with minds set on earthly things. But our citizenship is in heaven…” (Phil. 3:19-20). “These all died in faith, not having received the things promised, but having seen them and greeted them from afar, and having acknowledged that they were strangers and exiles on the earth…. But as it is, they desire a better county, that is, a heavenly one” (Heb. 11:13, 16). “We look not to the things that are seen but to the things that are unseen. For the things that are seen are transient, but the things that are unseen are eternal” (2 Cor. 4:18). 1. Being heavenly minded helps you persevere during difficult times. In 1952, Florence Chadwick attempted to swim from Catalina Island to California. Unfortunately, she decided to quit when she was less than half a mile from the shore. At a news conference the next day Chadwick said, “All I could see was the fog…. I think if I could have seen the shore, I would have made it.” Being heavenly-minded is like seeing the shore. 2. 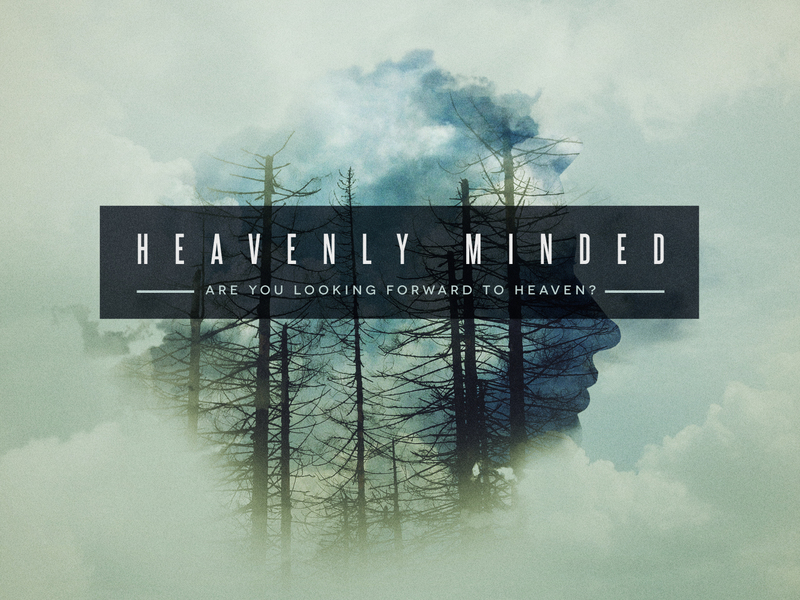 Being heavenly minded encourages you to devote your life to what really matters. When people are at a funeral—when they are forced to think about life and death—their perspective on life often changes (though usually only for a little while). Thinking about eternity helps us better evaluate our lives and set better priorities. And [Paul and his companions] went through the region of Phrygia and Galatia, having been forbidden by the Holy Spirit to speak the word in Asia. And when they had come up to Mysia, they attempted to go into Bithynia, but the Spirit of Jesus did not allow them. So, passing by Mysia, they went down to Troas. And a vision appeared to Paul in the night: a man of Macedonia was standing there, urging him and saying, “Come over to Macedonia and help us.” And when Paul had seen the vision, immediately we sought to go on into Macedonia, concluding that God had called us to preach the gospel to them (Acts 16:6-10). People try all sorts of strange methods in their attempts to discover God’s will for their lives. There is the “Random Bible Verse Method.” Close your eyes, open your Bible, and point to a random verse. This verse will contain a clue about God’s will for your life. There is the “King Saul Method.” Saul visited a medium when God wouldn’t answer his prayers for direction (1 Sam. 28:3-25). I don’t recommend any of these methods for discovering God’s will (especially the last one). The Bible gives us clear direction for moral decisions, but the Bible is silent on the morally neutral decisions we face (e.g., what kind of car you should buy). When there is no clear direction from God, what should we do? Pray for wisdom. “If any of you lacks wisdom, let him ask of God, who gives generously to all without reproach, and it will be given him” (James 1:5). Spend time reading and studying the revealed will of God (found in the Bible). Offer your life to God as a “living sacrifice” (Rom. 12:1). Ask for advice from people you trust and respect. Don’t expect to be 100% sure of the right decision. God will never reveal to you every step you should take. God is not going to give us all of the answers we’d like to have. We have to believe that he will guide and help us as we take each step. “We walk by faith, not by sight” (2 Cor. 5:7). “A man’s steps are from the LORD” (Prov. 20:24). “Behold, I go forward, but he is not there, and backward, but I do not perceive him; on the left hand when he is working, I do not behold him; he turns to the right hand, but I do not see him. But he knows the way that I take; when he has tried me, I shall come out as gold” (Job 23:8-10). Paul and his companions were “forbidden by the Holy Spirit to speak the word in Asia” (Acts 16: 6). Then “they attempted to go into Bithynia, but the Spirit of Jesus did not allow them” (v. 7). (The following two points about closed doors are taken from Charles Swindoll's book The Mystery of God's Will, p. 196). 1. The closing of a good opportunity occurs in order to lead you to a better one. Can you think of a closed door in your life that you are now thankful for? 2. Not until you walk through the open door will you realize the necessity of the previously closed one. Life is sort of like a funhouse maze. You may bounce off a lot of closed doors, but that is God’s way of forcing you into his open one. Just keep moving. When Paul encountered a closed door, he didn’t stop and give up. Throughout the book of Acts, Paul is constantly moving from place to place (see Acts 16:11-34). Before we become concerned with the morally neutral decisions of life, we must first follow God’s moral will. If you are following God’s revealed will for your life, do whatever you want! Of course, if you're seeking to obey God's revealed will, "whatever you want" will be things you believe will glorify God. John MacArthur writes, “The will of God is not, first of all, for you to go there or work here. 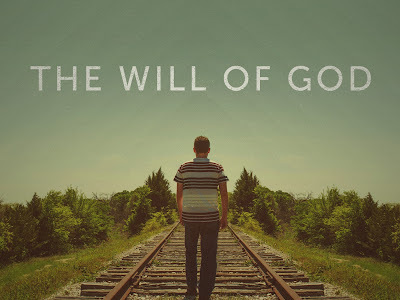 The will of God concerns you as a person. 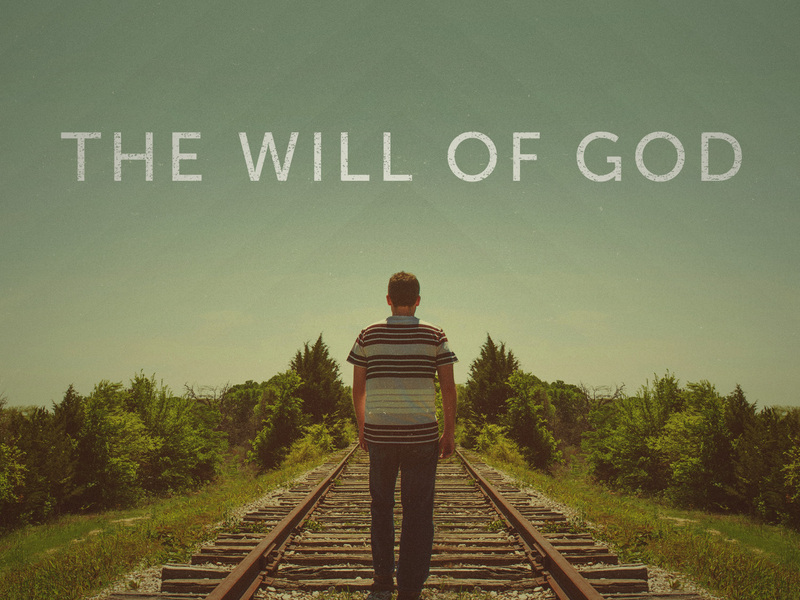 If you are the right you, you can follow your desires and you will fulfill His will”(Found: God's Will, p. 75).